The Robert L. "Bobby" Rearden Spirit of Winship Award was launched to recognize those who demonstrate exemplary service, teamwork, and a commitment to public good. Atlanta remembers Robert L. "Bobby" Rearden as a successful businessman and a member of the bid team that brought the 1996 Centennial Olympic Games to Atlanta. Winship remembers him as a steadfast supporter and a man of great spirit and compassion. Rearden passed away in January 2015 while undergoing treatment for a recurrence of leukemia, and in his honor the Robert L. "Bobby" Rearden Spirit of Winship Award was launched to recognize those who demonstrate exemplary service, teamwork, and a commitment to public good. The Spirit of Winship Award will be given annually to a faculty or staff member and a volunteer and will include a monetary award to be made in the name of each award recipient to an area of their choosing within Winship. The first recipients of the award were named in 2016. 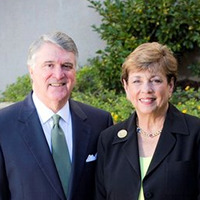 Dell Rearden, Bobby Rearden's widow, says, "Bobby would have been proud and honored to see how his legacy lives on by recognizing the many wonderful faculty, staff, and volunteers who exemplify Winship's culture of caring." 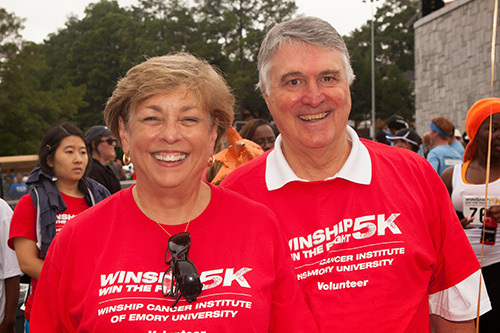 Dell and Bobby Rearden at the Winship Win the Fight 5K Run/Walk.